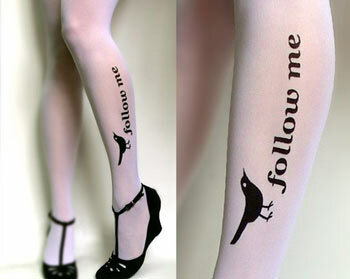 A Twitter “follow me” design! Not sure whether I’d ever wear this, but I know some people who would love these socks! There are 6 different colours, but it depends per design which colours are available: white, ultra pale, light mocha, deep mocha, cafe latte and grey. The socks come in knee-high and thigh-high length, in sizes S-XXL, and the prices range from $13-$23. Check out the Etsy store to see more designs and to get a pair for yourself.